Plastic pollution is becoming an urgent environmental problem. Globally, thousands of tonnes of plastic enter our waterways and oceans each year. Plastics in the environment break up into smaller and smaller pieces over time. This means that the impacts of plastic pollution are long term, and can become increasingly difficult to manage. Late last year the Victorian Government committed to banning single-use, lightweight plastic shopping bags. We asked Victorians for their views on how we could design a ban to be effective and lasting. We also asked for feedback on what else we could to reduce the impacts of other types of single-use plastics. You can view the discussion paper, Reducing the impacts of plastics on the Victorian Environment, below. Thank you to everyone who provided feedback on the Victorian Government's plastic pollution consultation. From the consultation, we received an overwhelming response of more than 8,000 submissions. This shows how strongly Victorians feel about protecting their environment and working towards a more sustainable future. Our consultation report summarises the feedback received on plastic bags and other forms of plastic pollution. It also outlines the details of the plastic bag ban and our next steps on plastic pollution in Victoria. The report can be viewed below. Step 1: In 2018, we will begin educating retailers and the community about plastic pollution and how to use fewer plastic bags. This will ensure the ban, once introduced, will be as effective as possible. Step 2: Over the next 12 months, the Victorian Government will develop a plan to prioritise the most effective actions to reduce other types of plastic pollution in our environment. A reference group of government, industry, retail and community group representatives will be established to help develop a plastic pollution plan and advise the government on how we will tackle other types of plastic pollution. Step 3: A legislative ban on single-use, lightweight plastic bags will begin by the end of 2019. 1a. Do you support a ban on single-use lightweight plastic shopping bags? You have 255 characters left. 2a. Should a ban include thick plastic shopping bags? 3a. Should a ban include plastic bags that break down over time such as biodegradable, degradable or compostable bags? 4. If lightweight plastic bags were banned, we will need to consider exemptions for some purposes, like medical or security activities. Are there any types of businesses, organisations or activities that you think should be exempt from a plastic bag ban? 6. What other options should the government consider to reduce plastic packaging in Victoria? 7. What else should the Victorian Governement do to reduce the impacts of litter at a local level and across the state? 8. How can Victorians be encouraged to further reduce the impacts of litter in their communities? 9. What other plastic pollution issues should government, business and communities work together to address? 10. What strategies to address plastic pollution do you think would be most effective? The Department of Environment, Land, Water and Planning (DELWP) is committed to protecting personal information provided by you in accordance with the principles of the Victorian privacy laws. The personal information you provide will be used to administer the public consultation process only. Your contact details may be used by DELWP to update you on the results of the consultation process, and to discuss the details of your submission further. Your submission has been collected by DELWP for the purpose of informing government policy about reducing the impacts of plastics on the Victorian environment. DELWP may do the following with your submission. Publish a copy of your submission on the DELWP website or other Victorian Government website. Quote directly from your feedback in the DELWP response to feedback and subsequent regulatory impact assessment. Make available to other Victorian Government agencies. For transparency and accountability, the contents of your submission may be published on a Victorian Government website which is accessible worldwide. Any person may view your comments. Your comments may remain on external servers, even once your comments are removed from the original website it was published on. All submissions are public documents and may be accessed by any member of the public unless you request, and your comments are given, confidential status. If you are making comment as an organisation, then your comments may be published, including the name of your organisation. If you are making comments as an individual, then your comments may be published, including your postcode but with no other details. If you wish to keep your address/contact details private you should refrain from including any information in your comments that could identify your address/contact details. If you provide your email address we will send you a copy of your submission for your records. Ignore this field. It is used to detect spammers. If you enter anything into this text box, your submission will be rejected. Ignore this field. It is used to detect spammers. If you enter anything into this text box, your submission will be rejected. Ignore this field. It is used to detect spammers. If you enter anything into this text box, your submission will be rejected. The survey form is now closed. Thanks for your contributions. Why are plastic bags a problem? When will the ban on lightweight plastic bags come into effect? What kinds of plastic bags will be banned? Nationally, we consume billions of plastic bags each year. Although only a small proportion of plastic bags used in Victoria end up as litter, the impact they have on the environment can be disproportionate. They can end up in our waterways, lakes and oceans – contributing to litter and posing a significant hazard to our marine life. Plastic bags will be banned in Victoria from by the end of 2019. In the lead up to the ban, we will educate and support businesses and consumers to transition away from single-use plastic shopping bags. Plastic shopping bags less than 35 microns thick will be banned, including degradable, biodegradable and compostable plastic shopping bags. 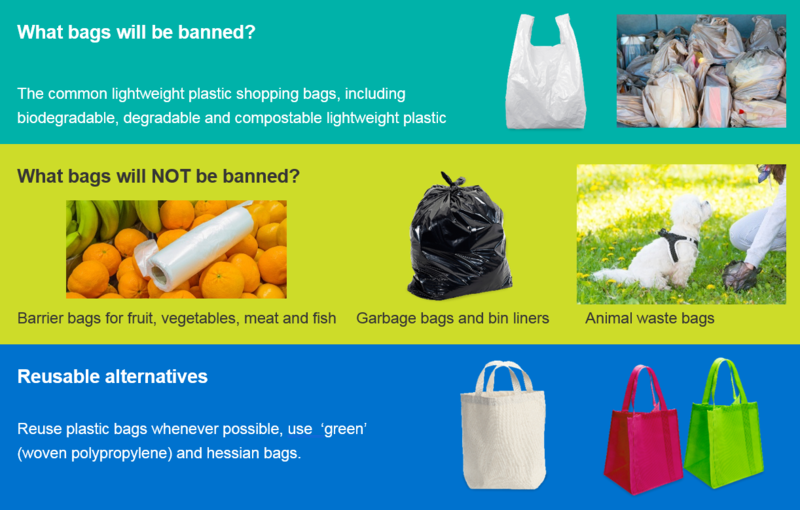 Heavier weight plastic shopping bags and other plastic bags, such as barrier bags for fruit, vegetables and meat products will not be banned. Why aren’t all plastic bags being banned? While we would like to reduce the use of plastic bags in Victoria as much as possible, we need to ensure appropriate alternatives are in place first. Why isn’t the government banning thicker plastic bags? Thick plastic bags can also impact the environment but they are an important transitional step for the community in phasing out lightweight plastic bags. While consumers adapt to the ban, having thick plastic bags available as a low-cost, often reusable alternative will ensure that the ban won’t disproportionately impact those who can’t afford more expensive alternatives if they forget their own bags. Why are biodegradable, degradable and compostable lightweight plastic bags included in the ban? Degradable, biodegradable and compostable plastic shopping bags also have adverse impacts on the environment, often breaking down into smaller plastic particles that are difficult to manage. Given that they look similar to other single-use plastic shopping bags and could be given away by retailers in the same way that plastic bags have been, including these bags in the ban will also help simplify the behaviour change required of consumers. We want people to move away from single-use bags to reusable bags. What are the costs and benefits of introducing a lightweight plastic bag ban? A preliminary cost-benefit analysis found that that banning plastic bags would likely have overall economic benefits to the state. There would be upfront costs to a ban (for example to purchase alternative shopping bags), but this cost would be offset over time by avoiding costs of single use plastic bags, and by benefits to the community and environment from avoided litter. If we take no action, it is estimated that over 10 years, annual consumption of lightweight plastic bags could increase from 1.6 billion to 1.9 billion. Why is it taking so long to introduce the ban? A lot needs to be done to enact the ban, including the formal processes required to develop legislation. Retailers and consumers also need adequate time to prepare for the ban. Phasing out plastic bags will begin this year with educating retailers and the community, building on the existing efforts of retailers and shoppers who have already stopped using plastic bags. Why is plastic pollution a problem? Plastics in the environment break up into smaller and smaller pieces over time, and can become increasingly difficult to manage. This means that the impacts of plastic pollution are long term, and can become increasingly difficult to manage. Marine animals are particularly at risk of swallowing or becoming tangled in plastic litter. What is already being done to reduce litter in Victoria? Over the last four years, the Victorian Government has invested over $100 million in waste and resource recovery initiatives, including programs to ensure Victoria’s litter rates remain the lowest in Australia. Recent litter programs include Litter Hotspots, which built partnerships between government, community and businesses to tackle litter in Victoria’s waterways, and the Litter Innovation Fund, which supported innovative approaches to prevent and reduce the impact of litter and illegal dumping. New litter programs are currently being developed which will build on these earlier efforts. Why doesn’t Victoria implement a beverage container deposit scheme (CDS)? While Victoria has the lowest litter rates in the country, we are always looking for ways we can do more. A container deposit scheme is likely to reduce litter, but we need to make sure that any new scheme is a good fit for Victoria and that its benefits outweigh the costs. We are watching with interest what happens in New South Wales and other jurisdictions as they introduce container deposit schemes, and considering implications for Victoria – in particular, how a container deposit scheme might affect our recycling industry, which is still responding to the impacts of China’s recent trade restrictions on mixed plastics for recycling. Description of the different types of shopping bag options available to customers. Preliminary cost-benefit analysis has found that that banning plastic bags would likely have overall economic benefits to the state. Our collection, use and disclosure of your personal information is bound by the Privacy and Data Protection Act 2014 (Vic) (the Act). We will only collect and use personal information in accordance with this Act and the Information Privacy Principles. Victoria’s Privacy regime and the Act are regulated by the Victorian Commissioner for Privacy and Data Protection. Engage Victoria is the Victorian Government's Online Consultation platform provided by the State of Victoria through the Department of Premier and Cabinet and supported by Harvest Digital Planning. It provides a platform for Victorians to be involved in public decisions that affect them. Who can use this site? Everyone who has internet access and a web browser is able to visit Engage Victoria If you would like to participate in interactive components such as commenting or voting on issues, you may need to register. Any user suspected to be providing misleading information, misrepresenting their identity or misusing the service will have their registration suspended. When you register with Engage Victoria we will ask you to choose a password. Please do not tell anyone else your password as you are solely responsible for all activities that occur on this service through your account. If you believe your account has been compromised or hacked, please inform us immediately by the Contact Us form so we can take appropriate action. If you have registered with Engage Victoria you can post comments and upload content to the service. Unless otherwise stated by us, the content that you post to Engage Victoria will be visible to all registered and unregistered users of the service. We do not guarantee any confidentiality in relation to the content that you post on Engage Victoria If you wish to provide confidential information, please contact the agency details relating to the particular consultation to arrange an alternative way to respond. Do we monitor the content posted on Engage Victoria? We monitor the content posted on Engage Victoria on a regular basis, but it is not possible to monitor all content submitted to the service at all times. This means that from time to time you may see inappropriate content on the site before we can remove it in accordance with the Community Guidelines. If you wish to report content that you believe is inappropriate, you can do so by using a reporting function or by emailing us at Contact Us. Although we monitor public submissions to the site, we do not assume responsibility for third-party content posted on the service. We do not make any warranties, express or implied, as to the timeliness, integrity, accuracy, appropriateness, legality, reliability or quality of the content posted on Engage Victoria. The content posted by agencies, by the public and by other stakeholders to Engage Victoria does not necessarily reflect the position, policies or views of the Victorian Government. When will we edit and remove content from Engage Victoria? Who is responsible for the content posted on Engage Victoria? All of the content that an individual posts to the site is their sole responsibility. Engage Victoria is not responsible for the content that is posted by users to the service. Engage Victoria does not endorse the views or material contained in the contributions of members of the public or third party sites and is not responsible for the content, availability or performance of external sites linked to or hosting the service. Consultation content presented through Engage Victoria is the responsibility of the agency or agencies responsible for the specific consultation process and any queries or concerns should be directed to that agency using the contact details provided within the consultation. We do not accept responsibility or liability for, arising from or in connection with content posted on the site. The Engage Victoria service is provided to you on an “as is” basis and we make no statements, representations or warranties about the timeliness, accuracy, completeness or reliability of any part of the service. If you want to use or rely upon content posted on Engage Victoria , it is your responsibility to independently evaluate the content and bear all risks associated with your use or reliance on this content. You are responsible for ensuring by independent verification its accuracy, currency or completeness. You use Engage Victoria and rely on any information contained on this service at your own risk. What if you don’t like the content in Engage Victoria? All reports will be evaluated and if your objection is upheld the content will be hidden from public view. Please note that we reserve the exclusive right to make the final determination of what is inaccurate, inappropriate or offensive. If we do not uphold your objection, we will communicate to you why your objection was not upheld provided that we have your valid contact information. What if Engage Victoria isn’t working? Access to Engage Victoria relies on internet and network technologies outside of our control. We do not guarantee that you will be able to continually access the service without interruption. We are not liable for any loss, damage, cost or expense resulting from any delay in operation or transmission, communications failure, internet access difficulties or malfunction in equipment or software. If you have difficulties accessing Engage Victoria please Contact Us. If you have registered with Engage Victoria but no longer wish to be registered, you can cancel your registration by Contact Us. Content that you have posted to Engage Victoria may remain on the service even after you have cancelled your registration and may be evaluated by agencies in their consultation processes. You are not entitled to have this content removed. You can choose to receive newsletters and other updates from Engage Victoria by email. If you then change your mind, you can unsubscribe at any time by following the process set out in the emails that we send you. Engage Victoria may contains links to websites which are not controlled or owned by us. Those websites have their own terms and conditions of use and you should familiarise yourself with them. We are not responsible or liable for the availability or content of any website linked to or from the Engage Victoria that is not owned or controlled by us. make any warranties or representations regarding whether other websites are free from viruses or malware and do not accept any responsibility for damage or loss caused by any such virus or malware. We do not agree to any conduct associated with a linked site which may be unlawful or an infringement of rights. Please ensure that you keep your own copies of your content, as Engage Victoria may not archive, store or back-up your content to make your content accessible online. We reserve the right to assume the exclusive defense and control of any matter otherwise subject to this indemnity clause. If we do so, you agree that you will cooperate and help us to assert any defences. You agree to release and discharge us, to the full extent permitted by law, from all actions, proceedings, claims or demands for costs and damages howsoever arising which you may have at any time against us arising out of or related to your use of the Engage Victoria service. We can suspend or terminate your access to the Engage Victoria service at our sole discretion at any time with or without providing you with notice and we can do so for any reason. You confirm that you own or have the right to use any copyright material included in your content and that you are not infringing any person’s rights by submitting the content to Engage Victoria . All intellectual property in the content of the Engage Victoria service (except for the content submitted by you and other users including other government agencies) including without limitation the text, software, source code, pages, documents and online graphics, photographs, sounds, audio, video and other interactive features are owned by or licensed to us and are protected by law, including but not limited to the Copyright Act 1968 (Cth). Engage Victoria may also contain third party material that is protected by law. To the extent permitted by applicable law, you unconditionally and irrevocably consent, and will obtain all other necessary unconditional and irrevocable written consents from other persons involved in producing any content, to any act or omission that would otherwise infringe any moral rights in any content which is transmitted by you onto the Engage Victoria service whether occurring before or after a consent is given. You agree that you must not institute, maintain or support any claim or proceeding against us for infringement of any of your moral rights (or the moral rights of any third person) arising from the transmission of content through use of Engage Victoria . Your agree that you must sign documents and do all acts and things reasonably required by us for the purpose of giving effect to our rights in relation to your moral rights consent. If you access Engage Victoria from a location outside of Victoria, you do so on your own initiative and are responsible for compliance with applicable local laws and Victorian laws. We may modify or discontinue any information or features that form part of the Engage Victoria service any time, with or without notice to you, and without liability. You may not assign any of your rights to use the Engage Victoria service to anyone. If we find that you have done so, we reserve the right to suspend and/or delete your account with Engage Victoria and take further action if warranted. Username (required) Your username will be displayed publicly. Password (required) Your password must have a minimum length of 8 characters and contain a mix of at least 3 of uppercase, lowercase, numeric or special characters ie % ! #. Postcode Enter the postcode where you live.